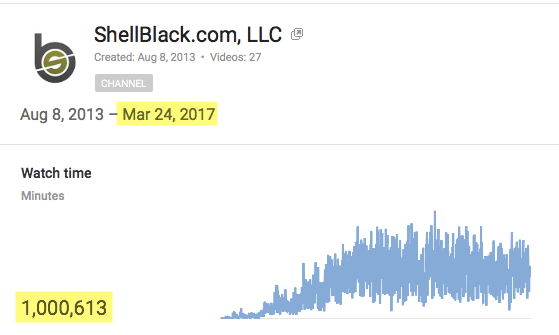 Back in August of 2013, the YouTube channel of ShellBlack Whiteboard episodes went live. The ShellBlack Whiteboard was a then new video series that explained the foundational concepts you need to know when working with Salesforce. I started recording the videos because I wanted to present Salesforce topics in the same manner in which I explained them to my clients – on a whiteboard. Nothing against using Help inside Salesforce, but it rarely gives you real world examples, best practices, or tips and tricks. As I write this I have five new episodes about to be published, so I thought it would be fun to share some stats on how the channel has grown over the years. On March 24th of 2017, we hit a pretty cool milestone – one million minutes of content watched! Not bad for a YouTube channel that doesn’t have any cat videos. Equally amazing is that people don’t bail out of an episode after a few seconds. It appears in most cases people are watching the entire episode, as the average watch time per view is four minutes and twenty four seconds. 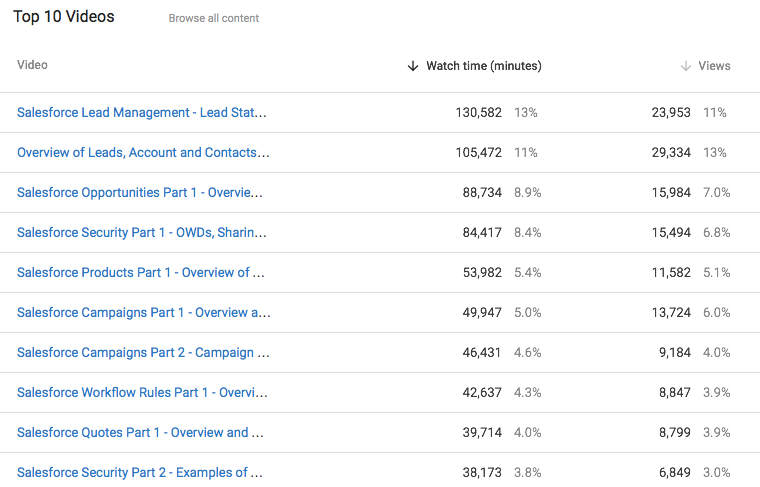 So if you’re doing the math, when we hit a million minutes watched at about 227 thousand views. Other tidbits you might find interesting are around viewership. Just over half of the watch time (54%) comes from the United States, with India second at 16% (the only other nation with double digits). About a quarter of the viewership is female at 27%. Most are watching the channel from a computer (88%), and another 10% of you are watching on a phone or tablet. Below is a list of the top 10 videos on the channel. I’ve really enjoyed the comments about the videos I’ve received on Twitter, email, and at events like Dreamforce and Texas Deamin’. 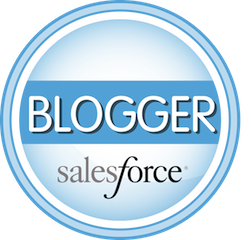 Some of you (including Salesforce employees) have said the content helped you pass a certification test. When I started the series I honestly never knew what to expect. Making the first few videos was a complete shot in the dark. Would the format work? Would I be able to articulate and explain the concepts well and accurately? Was the production quality good enough? Do I look like a dork? Many have asked about how we film the series. I start with an outline that I write myself. That outline becomes the content you see on the whiteboard (which I scribble myself). 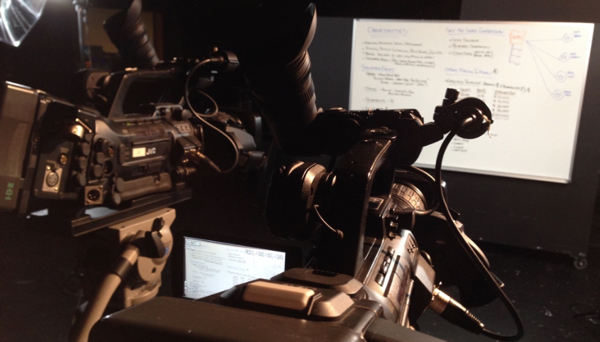 We usually have two cameras – one for a wide angle view and one for close-ups. We have used a third camera on some episodes. The cameras record simultaneously and we edit between the two camera angles (I don’t do any of the editing by the way). Sometimes I have a lapel microphone, sometimes we just have boom mics overhead out of the shot that you don’t see in order to grab the audio. I record at a studio during off-hours (on a Sunday) to keep costs low. I shoot anywhere between four and six episodes in a single day. 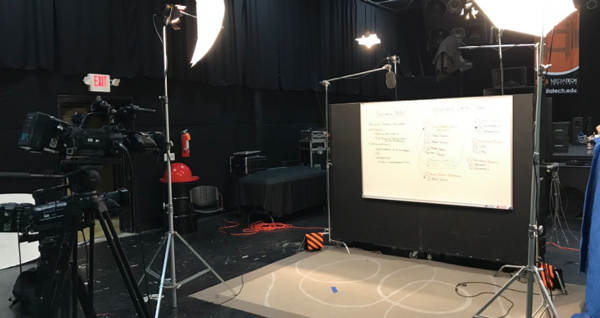 Because we’re shooting so many episodes in a day, we film somewhere between two and four takes to capture an episode, and then I have to clean the whiteboard and start writing the content for the next video. That doesn’t mean I can get through a full episode in one take. There have been plenty of times during filming that I have epic fails and we have to start over. Sometimes I can’t get 30 seconds in without blowing the shot. We then pick the best take and move on to maximize filming time. So yes, the majority of the episodes you see are based on one take. I’m talking straight through rather than splicing together an episode from multiple takes. I have to say, it’s incredibly awkward to be filmed and it’s still a bit uncomfortable for me to watch the episodes. I get nervous every time we start recording and the camera’s little red light go on. I have slip ups, occasional misspelling on the whiteboards, and my chicken scratch handwriting is embarrassing (sorry everyone!). If you haven’t noticed, I do have a uniform for the show – blue shirt, black pants. It’s my Mr. Rodgers outfit when I film. I hope you enjoyed learning about the ShellBlack Whiteboard videos, and most of all – thank you for watching!